Thanks for coming back and visiting again! I'm still in the midst of trying to move (more on that later in the weekend) - but for now here's another "classic" post, from my old Yahoo Group days! I pray you're blessed by this post on Communication! Words are so important that there are over 500 references to the word "words" in the Bible. Granted, some of these are referring to God's words, which should not be ignored. But several of these are written to us, about what WE say. It's interesting to read what Solomon gave us as his bit of wisdom (above). How I wish I memorized this scripture early on in my Christian life!! I do not know ANYONE who does not regret saying SOMETHING at some time in his or her life. It seems that we have all offended someone (knowingly or not) or have been misinterpreted. I can think of several times in the last year that I would like to go back and change my words! Even with this lesson it is hard for me to keep my mouth shut! In both the Old and New Testament we are instructed on what we should say (or NOT say!) and how our words should be spoken. 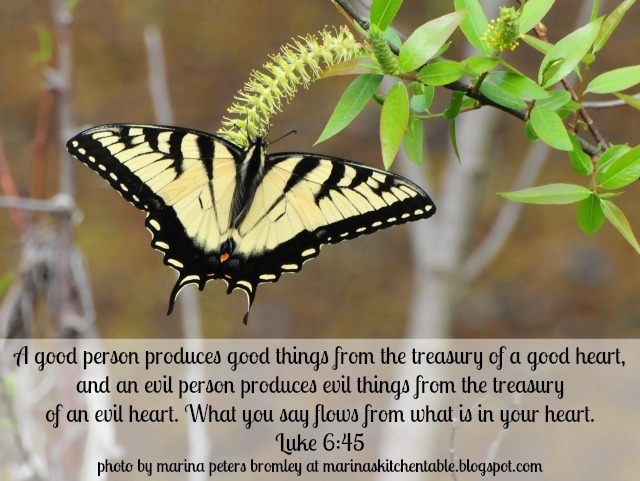 I love how we are taught in Luke6:45, "A good person produces good deeds from a good heart, and an evil person produces evil deeds from an evil heart. Whatever is in your heart determines what you say." This is not only a lesson for us to monitor OUR words, but helps us to discern the source of the words we hear. It makes me think, "consider the source" when I have heard hurtful things, whether it is against me personally or the Christian body as a whole. It is also a good reminder that what WE say gives others a magnifying glass to our own heart. Not only the words we speak at church, but in line in the grocery store (in front of strangers), in the break room at work (around our co-workers), or in our homes (in front of our children). So not only are our actions being watched (the expressions on our faces, the way we treat others, etc) but also our words, showing what we are made up of. The other part of communicating is listening. How can we know what we are talking about if we are not listening to what is going on? While attending college in Southern California in the late 70's, I heard a saying in both my Speech and Management classes. Now remember, this was a secular, State run learning institution, and I didn't know ANY Christians (or so I thought). The quote that appeared often was this, "God gave us two ears and only one mouth, so we should listen twice as much as we speak." The message was very clear… LISTEN! I have learned that this is true whether it is listening to our pastor, our family members, or God Himself. We have to listen twice as much as we talk, or pray. Allow time to "hear" God through His word, the Bible, or to just "listen" to Him speak to your heart in prayer. Encourage your family to listen during church and set an example by taking notes and listening intently. Just as important, listen to what is said in your home. If you are hearing words that are offending you (or God) consider the source of contamination. Is it the TV, friends, music, or books? Is it exposing a heart that has drifted from God? Then spend some time with God and LISTEN to how He directs you to change them. He will give you the tools and courage to make those changes whether they need to be made in yourself, or in your home.